Jim Giancarlo puts together an inspired life for himself and for numerous other theater artists on a daily basis. As we sipped steaming coffee at Bloomsbury Café last Friday, I could easily see that he brings a relaxed creative atmosphere wherever he goes. 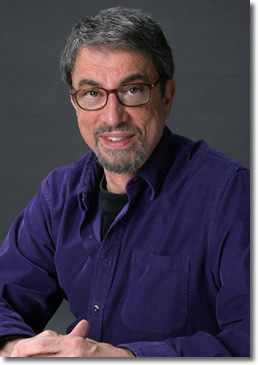 He wrote and directed “Ali Baba,” opening that evening. EH: So you grew up on the East Coast? JG: I grew up in Buffalo, N.Y.
EH: And that’s where you went to the university? JG: My degree is in visual art. So I kind of came to theater in a back-door sort of way. When I was in college I started doing quite a bit of writing. I moved to San Francisco in 1972 to write, and I immediately got caught up in dance, which was always a secret passion. I was 25 when I started training as a dancer. EH: It’s inspirational, that you went to dance at age 25. People don’t think of doing that. JG: It was always in me to do that. It just took a while. I also got involved in theater at the same time. So the two things were always really connected for me. Then I started a theater company with some people called Trench Mouth Musical Productions, and then Boulevard Dance Theater in San Francisco. In 1976, I was hitting that point where I thought I had to start thinking a little more practically. Then I got a job at the Oregon Shakespeare Festival. I’d had an accident and had my leg in a cast, but Judy Kennedy hired me anyway. I just loved Ashland. I worked at OSF for six seasons over a period of 10 years. In 1985 the Britt Musical Festival hired me to choreograph a production of “Grease”. The people on that production team formed the Oregon Cabaret Theatre in 1986. EH: As a visual artist were you a painter or a sculptor? JG: I did a lot of photography and collage. Because I was already an artist in other media, as soon as I started dancing I immediately started choreographing. As soon as I started accumulating a new language, I couldn’t wait to start composing in that language. At Oregon Cabaret Theatre, I direct and choreograph. I’ve written eight shows. I work closely with our wonderful graphic designer, David Ruppe, on brochure, poster and program design. Craig Hudson designs most of our sets. EH: “Ali Baba” takes place in the Middle East? JG: It’s a fable, so it’s set in a mythic, fairy-tale Middle East-North African desert setting. It is broad comedy cobbled together from various “Tales of the Arabian Nights” with our own craziness thrown in. EH: Do you have shows that come in from out of town as well? JG: Sometimes. It’s been quite a while since we have done that. The shows we do are almost all our own productions. The actors come from all over. I do auditions all over the country. I advertise in the trade papers, hire a hall and an accompanist, and do auditions. Nowadays with technology people can send you video clips from their shows. Some have their own Web sites. EH: Then you sign a contract? JG: Most contracts are for about three months. We fly them out; we house them, and take good care of them. Most are non-Equity. We definitely have a reputation for offering one of the best non-Equity contracts around. It’s a desirable contract. My job as Artistic Director is primarily selecting the season, auditioning, casting, hiring directors, actors and all of that. It’s kind of a collage, putting these elements together to see if it’s going to make a nice composition. Before the Cabaret I was beginning to think that I had dabbled too much rather than being really great at one thing. Then the Cabaret came along as a golden opportunity and I realized that in this job all those skills get used. I’ve found my place. That’s a blessing, 23 years later to be still doing it.